I really do not know where this story originally comes from but here it is nonetheless. 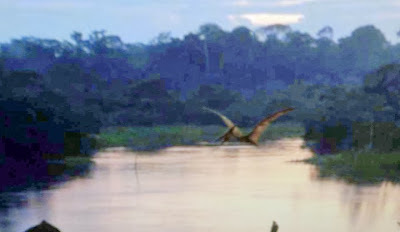 Reportedly this photo of a living pterodactyl was taken in 2005 by a couple on vacation in Brazil. The couple was near a swamp when they took a picture of what they thought was a stork. They were about 200 feet away from the creature, according to the story. 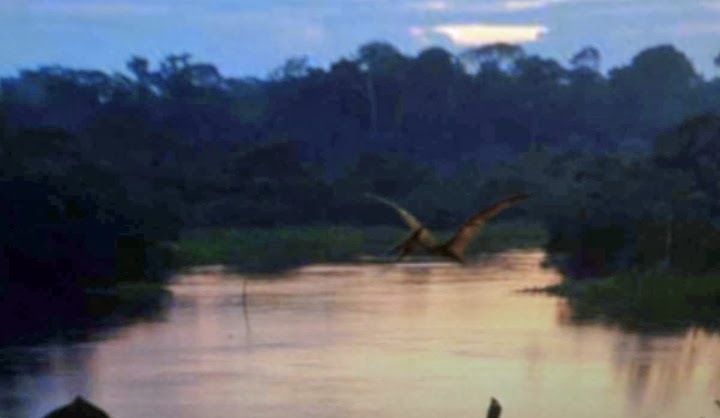 While I think this photo is a hoax, there has been other photos and reports over the years of Pterodactyls, none of which are accepted as 100 percent real. Here is a lightened version of the above photo. If you notice in the above photos there is no reflection of the Pterodactyl on the surface of the water while everything else is casting a reflection. So I can conclude it is a fake. Do you think there could possibly be any living pterodactyl left? I know there are other reports of sightings and stuff. I wonder about places like the Congo, where it is estimated that 80 percent of the land is unexplored.